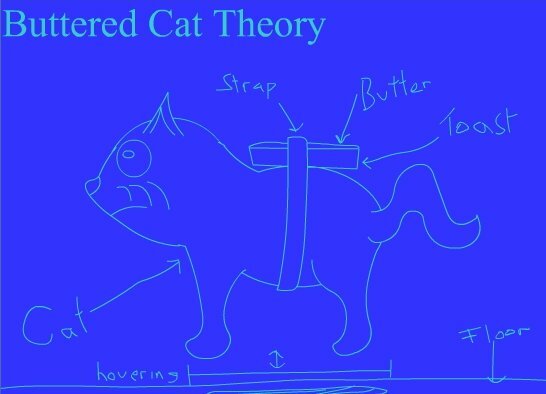 Basically: Cats always land on their feet, toast always falls butter side down. What happens when you attach a piece of buttered toast to the back of a cat and then drop it? The most common conclusion is that the cat/toast amalgam will fall to within a few inches of the floor, and then the speed of decent will decrease, as the two forces try to out-strain each other. This will (theoretically) cause hovering. In addition, as the cat struggles to get its feet to the floor, spinning may occur. There are many other factors which will affect this event, such as the relative sizes of the cat and toast, and the environmental conditions under which the experiments are undertaken.